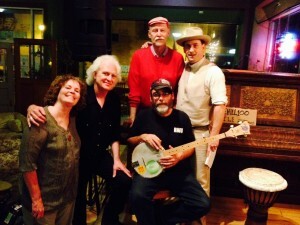 “For those who wonder about the lineage of Woody Guthrie’s celebrated songs of social conscience and labor activism, the Shelby Bottom Duo & Friends have provided a compelling answer with the Joe Hill Roadshow—a collection that places top notch musicianship and heartfelt singing at the service of songs as meaningful now as they were when Hill wrote them a century ago.” —Jon Weisberger, International Bluegrass Music Association Songwriter of the Year and Print Media Person of the Year. Sunday, Jan. 8, 2017, 4 pm, House Concert by Shelby Bottom Duo and a talk by art historian Gail Levin about the paintings of Edward Hopper. 308 Oxford Street, San Francisco. Limited space. Please contact bernellalevin@gmail.com if you plan to attend. Saturday, April 15, 2017, Louisville, KY Shelby Bottom Duo with John Paul Wright, locomotive engineer, community organizer, union organizer, labor singer, poet and djembe player. April 2017, AFL-CIO of Knoxville, date pending. February, March and April 2017 dates pending for Nashville Musical History shows. For more information, contact bernellalevin@gmail.com.